Xerri, D. (in press). A TESOL practicum in Malta. In A. Cirocki, I. Madyarov & L. Baecher (Eds. ), Global perspectives on the practicum in TESOL. Cham: Springer. Xerri, D. (in press). Researching teacher research. In G. Barkhuizen (Ed. ), Qualitative research topics in language teacher education. London and New York: Routledge. Xerri, D. (in press). Teacher research. In H. Mohebbi & C. Coombe (Eds. ), Research questions in language education and applied linguistics. Cham: Springer. Xerri, D. (in press). Is travel the midwife of thought? The Use of English. Xerri, D. (2019). [Review of the book Feature films in English language teaching, by B. Viebrock]. ELT Journal, 73(1), 92-94. Xerri, D. (2019). Foreword. In E. Domínguez Romero, J. Bobkina, & S. Stefanova (Eds. ), Teaching literature and language through multimodal texts​ (pp. xv-xvi). Hershey, PA: IGI Global. Xerri, D. (2019). Developing teachers' conceptions of research. In T. Pattison (Ed. ), IATEFL 2018: Brighton conference selections (pp. 195-196). Faversham: IATEFL. Xerri, D. (2019, March). Facilitating public access to learning. Modern English Teacher, 28(2), 42-43. Xerri, D. (2019, January). Exercise as a form of professional support. Modern English Teacher, 28(1), 24-26. Xerri, D. (2018). Teaching English in a multilingual classroom: Addressing challenges through teacher education and development. In P. Romanowski & M. Jedynak (Eds. ), Current research in bilingualism and bilingual education​ (pp. 143-153). Cham: Springer. Xerri, D., & Vella Briffa, P. (Eds.). (2018). Teacher involvement in high-stakes language testing. Cham: Springer. Xerri, D., & Vella Briffa, P. (2018). Introduction. In D. Xerri & P. Vella Briffa (Eds. ), Teacher involvement in high-stakes language testing (pp. 1-7). Cham: Springer. Vella Briffa, P., & Xerri, D. (2018). Conclusion. In D. Xerri & P. Vella Briffa (Eds. ), Teacher involvement in high-stakes language testing (pp. 341-345). Cham: Springer. Xerri, D. (2018). Dark and literary: A tour to the Isle of the Dead. Journal of Language and Cultural Education, 6(2), 126-143. Xerri, D. (2018). The use of interviews and focus groups in teacher research. The Clearinghouse: A Journal of Educational Strategies, Issues and Ideas, 91(3), 140-146. Xerri, D. (2018). Two methodological challenges for teacher-researchers: Reflexivity and trustworthiness. The Clearing House: A Journal of Educational Strategies, Issues and Ideas, 91(1), 37-41. Xerri, D. (2018). Engaging teachers and students with writing’s quantum of poetry: Australia’s Red Room Poetry. New Writing: The International Journal for the Practice and Theory of Creative Writing, 15(3), 360-369. Xerri, D. (2018). Poetry teaching in Malta: The interplay between teachers' beliefs and practices. In A. Goodwyn, C. Durrant, L. Reid & L. Scherff (Eds. ), International perspectives on the teaching of literature in schools​ (pp. 133-141). London and New York: Routledge. Xerri, D., & Pioquinto, C. (Eds.). (2018). Becoming research literate: Supporting teacher research in English language teaching. Sursee: ETAS Journal. Mackay, J., Birello, M., & Xerri, D. (Eds.). (2018). ELT research in action: Bridging the gap between research and classroom practice. Faversham: IATEFL. Mercer, S., & Xerri, D. (2018). Doing research to find answers to your questions. In R. Bicknell & L. Nikkanen (Eds. ), Malta conference selections 2017​ (pp. 7-11). Faversham: IATEFL. Xerri, D. (2018). It’s a many splendored thing: Reconceptualising teacher creativity. In T. Pattison (Ed. ), IATEFL 2017: Glasgow conference selections (pp. 104-106). Faversham: IATEFL. Xerri, D. (2018, Autumn). Teacher creativity in materials writing. Teaching Times, 6-7. Xerri, D. (2018, Summer). 'Generating knowledge for themselves': Kathleen Graves on teacher research. ETAS Journal, 35(3), 38-39. Xerri, D. (Ed.). (2018, Summer). Research literacy: Supporting teacher research in English language teaching: Special supplement III. ETAS Journal​, 35(3), 37-55. Xerri, D. (2018, Spring). Reflective spaces for English language teachers. The English Connection, 22(1), 7-8. Xerri, D. (2018, Spring). The ghosts of teachers past: Finding one’s voice as a teacher. IH Journal of Education and Development, 44, 13-16. Xerri, D. (2018, May). True grit. English Teaching Professional, 116, 46-47. Xerri, D. (2018, March). Enhancing creativity via teacher education. The Teacher, 3(157), 24-28. Xerri, D. (2018, April). Building empathy toward migrants via poetry. Modern English Teacher, 27(2), 42-43. Xerri, D. (2018, Spring). 'It's poetry, not drama! ': The value of performing poetry. ETAS Journal, 35(2), 32-33. Xerri, D. (2018, Spring). ‘Research by teachers for teachers’: Richard Smith on teacher research. ETAS Journal, 35(2), 38-39. Xerri, D. (Ed.). (2018, Spring). Research literacy: Supporting teacher research in English language teaching: Special supplement II. ETAS Journal​, 35(2), 37-51. Xerri, D. (2018, March). Teachers as lighthouse keepers. English Teaching Professional​, 115, 57-58. Xerri, D. (2018, January). The beauty of failure and disappointment. Modern English Teacher, 27(1), 59-61. Xerri, D. (2017). Split personality/unified identity: Being a teacher-researcher. ELT Journal, 71(1), 96-98. Xerri, D. (2017). ‘Help them understand the complexity, the difficulties and the pleasures of creative writing’: Children’s author Libby Gleeson on creativity in education. New Review of Children's Literature and Librarianship, 23(2), 95-105. Xerri, D. (2017). Combating voice poverty through spoken word poetry: An interview with Candy Royalle. Journal of Poetry Therapy: The Interdisciplinary Journal of Practice, Theory, Research and Education, 30(4), 262-270. Xerri, D. (2017). Using questionnaires in teacher research. The Clearing House: A Journal of Educational Strategies, Issues and Ideas, 90(3), 65-69. Xerri, D. (2017). Mountain climbing in the poetry classroom in Malta: Teaching a Stevens metapoem. The Wallace Stevens Journal, 41(2), 270-277. Xerri, D. (2017). Poetry education research as an anchorage of thought: Using poetry as interview stimulus material. International Journal of Research & Method in Education, 40(4), 379-388. Xerri, D. (2017). Inspiring young people to be creative: Northern Ireland’s poetry in motion for schools. New Writing: The International Journal for the Practice and Theory of Creative Writing, 14(1), 127-137. Xerri, D., & Vella Briffa, P. (2017). Teacher-designed, high-stakes English language testing: Washback and impact. In P. C. L. Ng & E. F. Boucher-Yip (Eds. ), Teacher agency and policy response in English Language Teaching (pp. 74-88). London and New York: Routledge. Xerri, D. (2017). Teachers’ beliefs and literature teaching: The case of poetry. In B. Schaff, J. Schlegel & C. Surkamp (Eds. ), The institution of English literature: Formation and mediation (pp. 207-229). Göttingen: V & R unipress. Xerri, D. (2017). When 'home is the mouth of a shark': Understanding migration through the use of multicultural poetry. In E. Erling (Ed. ), English across the fracture lines: The contribution and relevance of English to security, stability and peace (pp. 57-62). London: British Council. Xerri, D. (2017). Ensure inclusive and equitable quality education and promote lifelong learning opportunities for all. In A. Maley & N. Peachey (Eds. ), Integrating global issues in the creative English language classroom: With reference to the United Nations sustainable development goals (pp. 49-55). London: British Council. Donaghy, K., & Xerri, D. (2017). The image in ELT: an introduction. In K. Donaghy & D. Xerri (Eds. ), The image in English language teaching (pp. 1-11). Floriana: ELT Council. Donaghy, K., & Xerri, D. (Eds.). (2017). The image in English language teaching. Floriana: ELT Council. Vassallo, O., Xerri, D., & Grech, S. (2017). Testing pre-service teachers' spoken English proficiency. In E. Gutiérrez Eugenio (Ed. ), Learning and assessment: Making the connections (pp. 39-45). Cambridge: ALTE. Xerri Agius, S., & Xerri, D. (2017). A shared research journey. In S. Etherington & M. Daubney (Eds. ), Developing as an EFL researcher: Stories from the field (pp. 53-56). Faversham: IATEFL. Xerri, D. (2017, Winter). Educational research: A reflection. ETAS Journal, 35(1), 12. Xerri, D. (2017, Winter). 'A classroom is a centre of inquiry in all its forms': Thomas S. C. Farrell on teacher research. ETAS Journal​, 35(1), 14-15. Xerri, D. (2017, Winter). 'Breaking boulders into pebbles': Christine Coombe on teacher research. ETAS Journal​, 35(1), 36-39. Xerri, D. (Ed.). (2017, Winter). Research literacy: Supporting teacher research in English language teaching: Special supplement I. ETAS Journal​, 35(1), 12-39. Xerri, D. (2017, Autumn). ‘The mother tongue of the human race’: Entrenched conceptions of poetry and their resonances in English education. The Use of English, 69(1), 4-12. Xerri, D. (2017, Autumn). Mehr licht! : Why publish poetry in unexpected places? Writing in Education, 73, 51-53. Xerri, D., & Mercer, S. (2017, October). How to reflect on research talks at a conference. EALTHY Magazine, 5, 11-12. Xerri, D. (2017, October). Battling inequity: What can two Harvard dropouts teach educators? Modern English Teacher, 26(4), 16-18. Xerri, D. (2017, Autumn). Business English in Malta. Business Issues​, 97, 16. Xerri, D., & Mercer, S. (2017, Autumn). IATEFL Research SIG. Business Issues, 97, 14-15. Xerri, D. (2017, August). Myriad views on creativity. Humanising Language Teaching, 19(4). Xerri, D. (2017, August 5). Specialised schools: What are the effects of having more English language students? Times of Malta, p. 14. Xerri, D. (2017, July). Teacher research as creative disruption. Modern English Teacher, 26(3), 17-19. Xerri, D. (2017, July). English teaching confessional. English Teaching Professional, 111, 13-14. Ončevska Ager, E., & Xerri, D. (2017, Summer). Teacher research: What is in it for teachers and how can teacher educators help? The Teacher Trainer, 31(2), 7-9. Xerri, D. (2017, Summer). Teachers as readers and writers of poetry: A workshop. Illinois English Bulletin,104(3), 37-49. Xerri, D. (2017, Summer). Enjoyment and understanding? Poetry pedagogy for student engagement. Teaching English, 14, 67-71. Xerri, D. (2017, Summer). In imitation of Hockney: The value of teacher versatility. ETAS Journal, 34(3), 14-15. Xerri, D. (2017, Summer). ‘Teachers want to know answers to questions’: Dudley Reynolds on teacher research. ETAS Journal, 34(3), 12-13. Xerri, D. (2017, May). Disrupting education. English Teaching Professional, 110, 4-5. Xerri, D. (2017, April). School leaders as architects of change. Modern English Teacher, 26(2), 77-78. Xerri, D. (2017, March). Trusting teacher intuition. The Teacher, 147, 21-24. Xerri, D. (2017). Teacher creativity as combinatory play. Humanising Language Teaching, 19(1). Xerri, D. (2017). The great mannequin warehouse. In M. Isaienkova, O. Lytovka & A. Tryniecka (Eds. ), Full stop (p. 31). Warsaw: IRF Press. Xerri, D., & Campbell, C. (2016). E-portfolios in teacher development: The better option? ELT Journal, 70(4), 392-400. Xerri, D., & Vella Briffa, P. (2016). Teacher involvement in high stakes testing. In C. Docherty & F. Barker (Eds. ), Language assessment for multilingualism (pp. 321-341). Cambridge: Cambridge University Press. Xerri, D. (2016). Igniting young people’s creativity: The Sydney Story Factory. New Writing: The International Journal for the Practice and Theory of Creative Writing, 13(1), 42-49. Xerri, D. (2016). A teacher's experiences highlighted by a stimulus poem. In S. Mann, The research interview: Reflective practice and reflexivity in research processes (pp. 292-295). Basingstoke: Palgrave Macmillan. Xerri, D. (2016). 'Poetry does really educate': An interview with spoken word poet Luka Lesson. English in Australia, 51(1), 18-24. Xerri, D. (2016). Teaching and learning English in a multicultural classroom: Strategies and opportunities. Journal of Multicultural Education, 10(1), 19-32. Xerri, D. (2016). 'We need to demystify poetry': An interview with David Musgrave. Symposia Melitensia, 12, 189-202. Xerri, D. (2016). 'Living in a house without mirrors': Poetry's cachet and student engagement. Anglica: An International Journal of English Studies, 25(1), 271-286. Xerri, D. (2016). 'Poems look like a mathematical equation': Assessment in poetry education. International Journal of English Studies, 16(1), 1-7. Xerri. D., & Vassallo, O. (2016). Creativity in ELT: An introduction. In D. Xerri & O. Vassallo (Eds. ), Creativity in English language teaching (pp. 1-7). Floriana: ELT Council. Xerri, D., & Vassallo, O. (Eds.). (2016). Creativity in English language teaching. Floriana: ELT Council. Xerri, D. (2016, Winter). Learning vs. studying: A false dichotomy. ETAS Journal, 34(1), 23-24. Xerri, D. (2016, Autumn). How to be a radical educator in an epoch of incredulity. The Use of English, 68(1), 64-71. Xerri, D. (2016, Autumn). When poetry is locked out. Writing in Education, 70, 45-47. Xerri, D., & Vassallo, O. (2016, November-December). Developing teacher language awareness. IATEFL Voices, 253, 7. Xerri, D. (2016, November). English for innovation. EFL Magazine. Grech, S., Vassallo, O., & Xerri, D. (2016, October 23). Worrying about language. The Sunday Times of Malta, p. 51. Campbell, C., & Xerri, D. (2016, October). Developing vocabulary proficiency. Modern English Teacher, 25(4), 4-8. Xerri, D. (2016, September). How a good language test can support effective learning: Putting learning, teaching and assessment together. TEASIG Newsletter, 59, 22-23. Xerri, D. (2016, August/September). Creative and personal responses to literary texts in ELT. The Teacher, 141, 23-25. Xerri, D. (2016, Summer). The significance of creative writing workshops for teachers. Writing in Education, 69, 60-63. Xerri, D. (2016, July-August). Teacher creativity. IATEFL Voices, 251, 5. Xerri, D. (2016, Summer). Writing informal correspondence in the primary classroom. English 4-11, 57, 13-14. Xerri, D. (2016, Summer). Embedding improvisation in teacher education. The Teacher Trainer, 30(2), 13-15. Xerri, D. (2016, Summer). Creative language teachers as bridge builders: The value of bisociative thinking. ETAS Journal, 33(3), 18-20. Xerri, D., Vassallo, O., & Grech, S. (2016, June 12). Primed for the global industry. The Sunday Times of Malta – Classified, p. 1. Xerri, D. (2016, April). The case for multimodal learning and teaching. Modern English Teacher, 25(2), 13-14. Xerri, D. (2016, March-April). High stakes English language testing. IATEFL Voices, 249, 4-5. Saleem, M., Tezak, K., Mercer, S., & Xerri, D. (2016, February). Creativity in ELT research. ELT Research, 31, 22-24. Xerri, D. (2016, January). Boosting assessment literacy through teacher involvement. Teacher Training and Education Newsletter, 5-6. Xerri, D. (2016). Foreword. In R. M. Cassar & K. Vella, I don't like studying (p. 5). Qormi: Outlook Coop. Xerri, D. (2015). Developing teacher language awareness via in-service training: Trainers’ beliefs. English Language Teacher Education and Development Journal, 18, 1-7. Xerri, D. (2015). The value of teacher portfolios for professional development in TESOL. In J. Angouri, T. Harrison, S. Schnurr & S. Wharton (Eds. ), Learning, working and communicating in a global context (pp. 243-249). London: Scitsiugnil Press/British Association for Applied Linguistics. Xerri, D., & Campbell, C. (2015). The contribution of portfolios to professional development in TESOL: An investigation into teachers’ beliefs and attitudes. Language in Focus: International Journal of Studies in Applied Linguistics and ELT, 1(1), 66-82. Xerri, D., & Vassallo, O. (2015). The learning ELT professional: An introduction. In D. Xerri & O. Vassallo (Eds. 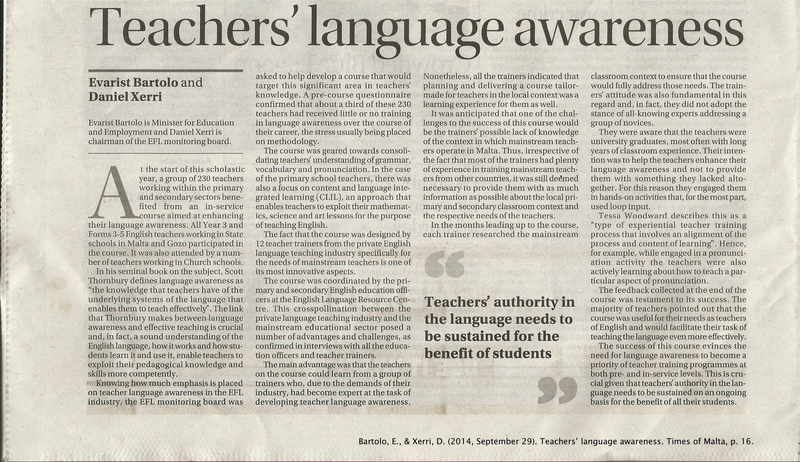 ), The learning ELT professional: 3rd ELT Malta conference selections (pp. 1-9). Floriana, Malta: ELT Council. Xerri, D., & Vassallo, O. (Eds.). (2015). The learning ELT professional: 3rd ELT Malta conference selections. Floriana, Malta: ELT Council. Xerri, D. (2015). Countering the hegemonic English curriculum: Intercultural competence through poetry. In D. Broudy, J. Klaehn & J. Winter (Eds. ), News from somewhere: A reader in communication and challenges to globalization (pp. 39-47). Eugene, OR: Wayzgoose Press. Xerri, D. (2015). Maximising the value of CLIL through teacher education and development. In S. Pokrivčáková (Ed. ), CLIL in foreign language education: E-textbook for foreign language teachers (pp. 112-118). Nitra: Constantine the Philosopher University. Xerri, D., & Xerri Agius, S. (2015). Galvanizing empathy through poetry. English Journal, 104(4), 71-76. Xerri, D. (2015). Poetry lessons. In K. Head & P. Blessinger (Eds. ), Teaching as a human experience: An anthology of contemporary poems (p. 162). Newcastle upon Tyne: Cambridge Scholars Publishing. Xerri, D., & Campbell, C. (2015). Implementing teacher portfolios for professional development. In T. Pattison (Ed. ), IATEFL 2014: Harrogate conference selections (pp. 205-207). Faversham: IATEFL. Xerri, D. (2015, Winter). Developing effective reading strategies in the ESOL classroom. Language Issues, 26(2), 61-64. Xerri, D. (2015, Winter). Word-formation for upper-intermediate level students. ETAS Journal, 33(1), 18-20. Xerri, D. (2015, December). Dissoi logoi: Fostering cognitive dissonance through teacher development. Teacher Development, 73, 3-5. Xerri, D. (2015, November-December). Teaching is speaking. IATEFL Voices, 247, 6-7. Xerri, D. (2015, Autumn). On owing one's poetic life to inspiring teachers of English. The Use of English, 67(1), 39-44. Xerri, D. (2015, October). Grappling with the present perfect. Modern English Teacher, 24(4), 66-68. Xerri, D. (2015, June). On teachers' creative life. MATEFL Newsletter, 11-13. Xerri, D. (2014). Cross-pollination in teacher development. The Educator: A Journal of Educational Matters, 2, 83-110. Xerri, D. (2014). Critical reading and student engagement with poetry. In S. Dymoke, M. Barrs, A. Lambirth & A. Wilson (Eds. ), Making poetry happen: Transforming the poetry classroom (pp. 29-35). London and New York: Bloomsbury. Xerri, D. (2014). Schools as ‘poetry-friendly places’: Michael Rosen on poetry in the curriculum. Arts Education Policy Review, 115(4), 151-158. Xerri, D. (2014). ‘Poetry is a tremendous ally’: Children’s poet Michael Rosen on teachers’ attitudes towards poetry. New Review of Children’s Literature and Librarianship, 20(2), 112-122. Xerri, D. (2014). The poetry of cities: On discovering poems in Istanbul, Sarajevo, and Bratislava. Journeys: The International Journal of Travel and Travel Writing, 15(1), 90-108. Xerri, D. (2014). PLN: Teachers’ use of social media for professional development. In T. Pattison (Ed. ), IATEFL 2013: Liverpool conference selections (pp. 217-218). Faversham: IATEFL. Xerri, D. (2014). Teachers’ use of social networking sites for continuing professional development. In Ġ. Mallia (Ed. ), The social classroom: Integrating social network use in education (pp. 441-464). Hershey, PA: IGI Global. Xerri, D. (2014, Winter). English teachers positioning themselves as poets. ETAS Journal, 32(1), 25-27. Bartolo, E., & Xerri, D. (2014, September 29). Teachers’ language awareness. Times of Malta, p. 16. Vella Briffa, P., & Xerri, D. (2013). Explicating an English speaking examination: Challenges and considerations. Symposia Melitensia, 9, 193-208. Xerri, D. (2013). Poetry writing in the post-16 English curriculum. English Teaching: Practice and Critique, 12(2), 140-155. Xerri, D. (2013). ‘Dissecting butterflies’: Literary theory and poetry teaching in post-16 education. International Journal of Adolescence and Youth, 18(4), 205-214. Xerri, D. (2013). Colluding in the 'torture' of poetry: Shared beliefs and assessment. English in Education, 47(2), 134-146. Xerri, D. (2013). The role of personal learning networks in teachers’ professional development. In A. Akbarov & D. Larsen-Freeman (Eds. ), Applying intercultural linguistic competence to foreign language teaching and learning (pp. 387-394). Sarajevo: International Burch University. Xerri, D., McGraw, R., Estevez, V., Campbell, R., & Brierley, M. (2013). The creation of a culture of reading. In T. Pattison (Ed. ), IATEFL 2012: Glasgow conference selections (pp. 79-82). Canterbury: IATEFL. Xerri, D. (2012). Multicultural poetry in ELT: Benefits, challenges and strategies. In P. Díez, R. Place & O. Fernández Vicente (Eds. ), Plurilingualism: Promoting co-operation between communities, people and nations (pp. 65-79). Bilbao: University of Deusto. Xerri, D. (2012). Poetry on the subway: An interview with children’s poet John Rice. New Review of Children’s Literature and Librarianship, 18(2), 105-115. Xerri, D. (2012). Poetry teaching and multimodality: Theory into practice. Creative Education, 3(4), 507-512. Xerri, D. (2012). Experimenting with Dogme in a mainstream ESL context. English Language Teaching, 5(9), 59-65. Xerri, D. (2012). The use of authentic texts with postgraduate students. Journal of Education and Learning, 1(1), 43-48. Xerri, D. (2012). The multimodal approach to using poetry in ELT. In T. Pattison (Ed. ), IATEFL 2011: Brighton conference selections (pp. 151-152). Canterbury: IATEFL. Xerri, D., & Xerri Agius, S. (2012, Summer). The use of literature in ELT. ETAS Journal, 30(1), 18-23. Xerri, D. (2012, October). Pennac on the Tube: Revaluing reading to children. English Drama Media, 24, 37-41. Xerri, D. (2012). Ditching the practice of insularity: The benefits of collaboration for a small language association. In T. Lamb, T. Atanasoska, M. Hepp, S. Jönsdottir & J. Zielinsky (Eds. ), Learning from each other: A handbook for language teacher associations (pp. 85-88). Graz: European Centre for Modern Languages. Xerri, D. (2011). Shared writing via contemporary poetry. English in Education, 45(2), 175-188. Xerri, D. (2011, March-April). Why collaborate? Associations pooling their knowledge, skills and resources. IATEFL Voices, 219, 22. Xerri, D. (2010). High stakes English testing: Factors contributing to candidates’ performance. Saarbrücken: VDM. Xerri, D. (2010). Seamus Heaney’s early work: Poetic responsibility and the Troubles. Dublin: Maunsel and Co.
Xerri, D. (2010). Ted Hughes’s art of healing. Palo Alto, CA: Academica Press. Xerri, D. (2001, March 24). L-arċipelagu tal-gulag [The gulag archipelago]. Il-Ġens Illum, p. 37. The opinions and statements expressed in this website do not necessarily reflect the views of the University of Malta.